In honor of our inpatient rehab unit being open for 5 years, this week we celebrated with fun events for patients, families and staff. Our theme for the week was “Paint the Town Rehab” and went from Oct. 30 to Nov. 3. 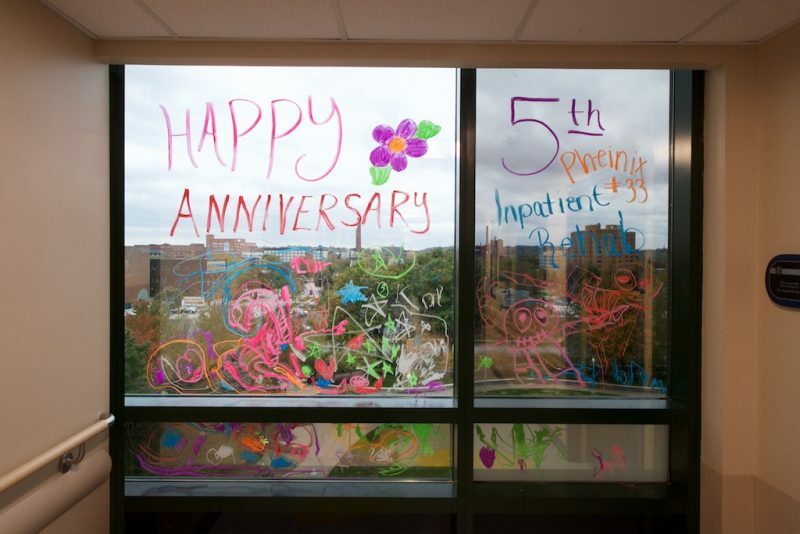 On Friday before our celebration began, we recruited patients to decorate the window on our rehab floor. Several patients joined us to paint colorful designs and “Happy 5th Anniversary Inpatient Rehab!” All of these patients had been participating in our inpatient rehab program and were more than happy to share their talents and work together to brighten the unit. To kick off the week on Monday, superhero capes were passed out to each patient and they were given masks to decorate as well. Debby Rowland from Kids Capes of Courage graciously created capes in all patterns and sizes, some even made specifically to our patient’s interests such as Paw Patrol and Star Wars. Some kids even chose to wear their capes and masks for Halloween the next day! 7100 staff members dressed up as superheroes – even though we all know the kids are the real heroes! Tuesday was “Superhero day” in honor of it also being Halloween. Patients also dressed up in their own unique attire – even a whoopee cushion and Elf on the Shelf. Our rehab patients went trick or treating all around the 2nd and 7th floor, with staff members throughout the hallways handing out treats. Clockwise, left to right: Dressed as a CLE fan, Kayden, 6, with this dad; Pheinix , 15, as Gru from Despicable Me; and Tzakary, 16, as a whoopie cushion. Staff members throughout the hospital also participated in a hospital wide reverse trick or treat, going around the units and handing out treats to patients, with some very elaborate costumes as well! 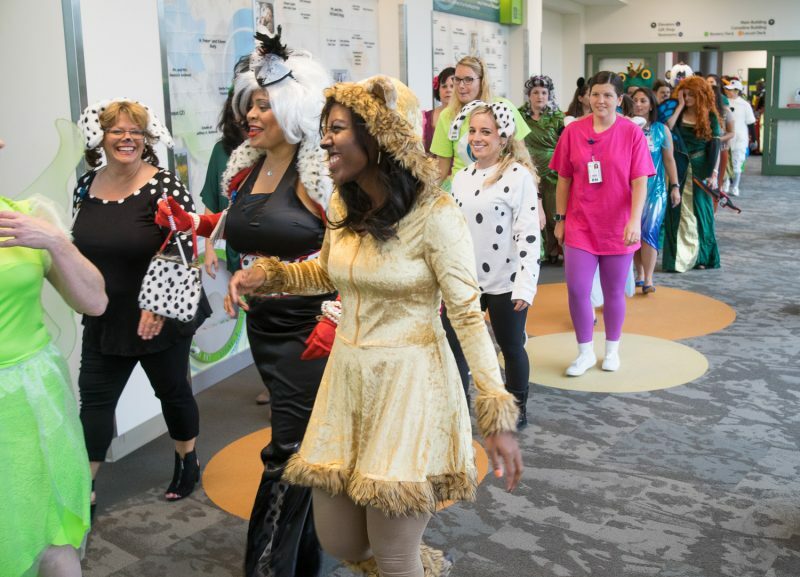 Employees from NeuroDevelopmental Science Center dressed as Disney characters parade around the hospital. We followed up Halloween with canvas paintings on Wednesday. A mix of inpatient and outpatient rehab patients came to our playroom and got to decorate their own canvas. Staff assisted as they painted their own masterpieces that will be displayed outside of the rehab unit. Jacob, 12, gets help from Sarah Brown, PT. 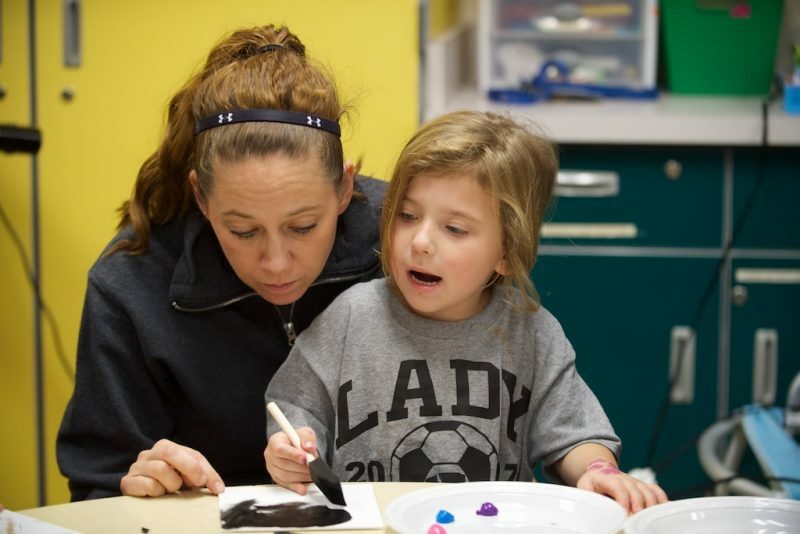 Mackenzie, 5, asks Stacy Parman, PT, a question as she paints a canvas. On Thursday night, our rehab patients were invited to a movie night where they were served pizza and snacks from the Kids Café. They chose to watch “The Sandlot” and some had fun playing games and spending time together. 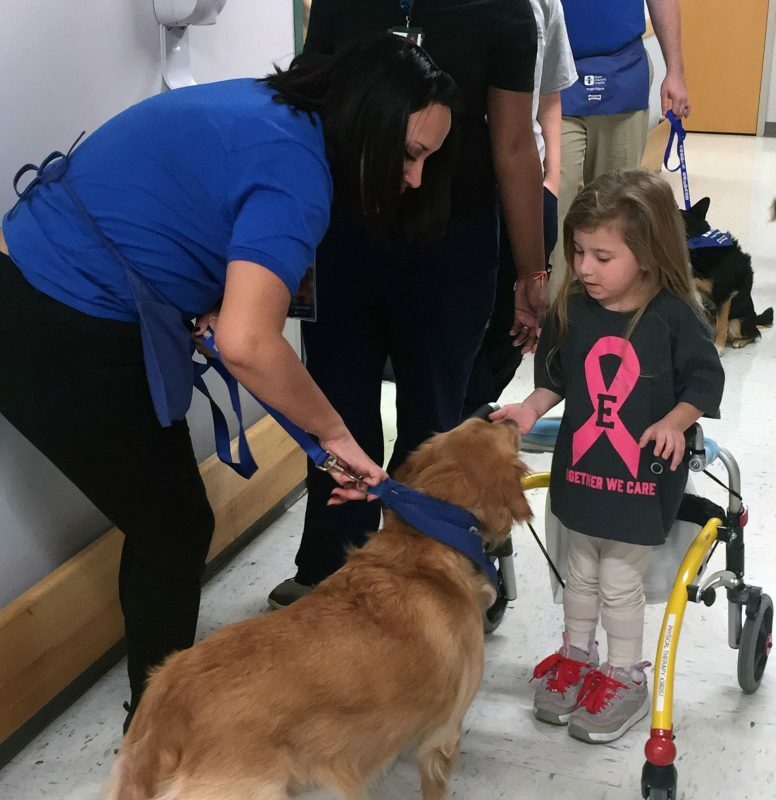 To wrap up our celebration, we had a total of six dogs from the Akron Children’s Doggie Brigade join us to visit our rehab patients. Many of the kids have had separate visits from the dogs throughout their admissions, but this was special, as many dogs came together just for the first ever Doggie Brigade parade! Doggie Brigade volunteer Anney Jeandrevin helps Mackenzie, 5, visit with Starr. 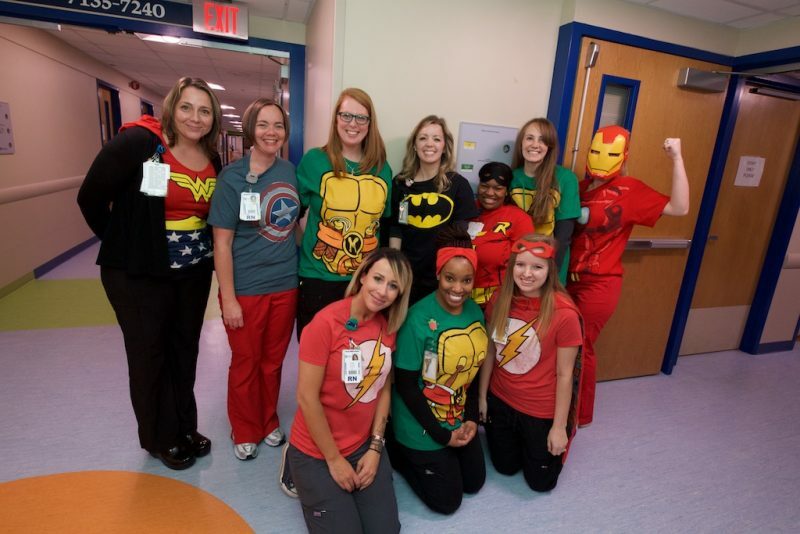 It was a “super” week celebrating all of the accomplishments of the rehab staff and patients. Over the past 5 years, there have been many come and go, all making a lasting impression. 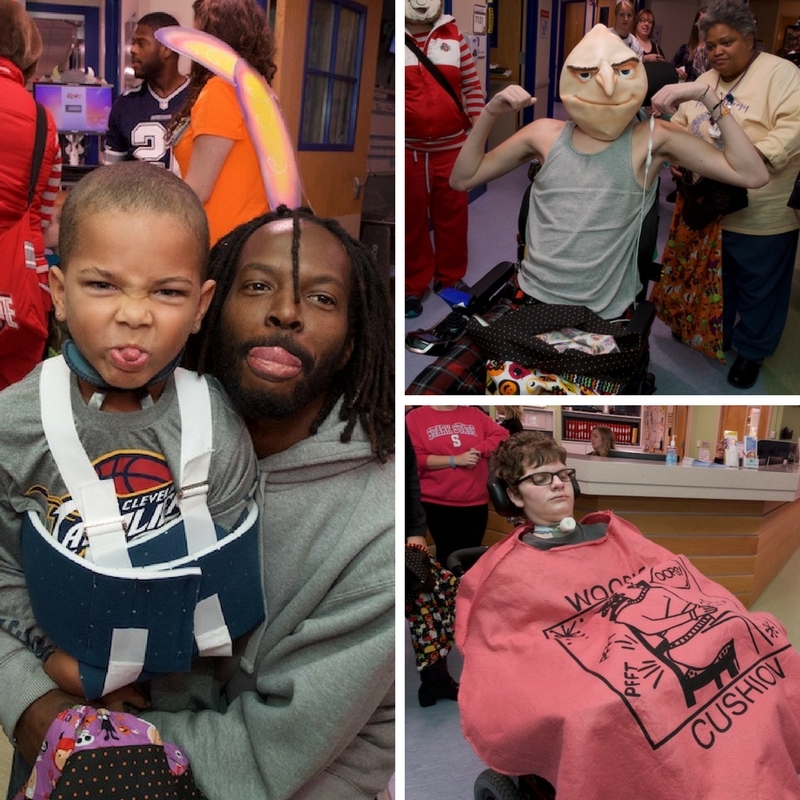 This week was memorable for the kids who were able to incorporate fun activities into their therapies. Staff had the opportunity to celebrate and recognize all of the hard work that has been put into making our inpatient rehab unit what it is today and look forward to the years to come.